In 1895 George Ludovic Houstoun granted a feu charter to Alexander Balfour McKechnie, then resident at Cochranfield, of 3 Roods 17 Poles of ground in the vicinity of the site of Cochran Castle. On this land Alexander McKechnie built his Red House. The site is located on the east side of Auchengreoch Avenue about 330 yards south east of the crossroads known locally as “Murphy`s Toll, on the B787 Beith Road, at the junction with the old Howwood Road. The building is constructed in the “Arts and Crafts” style which was much in vogue in that period. The ideal was to use local materials and the skills of a previous age to construct buildings of simplicity and move away from the Classical and Gothic styles with their excessive ornamental features. Arches were to be curved instead of peaked, many of the buildings were of modest scale and in styles more like the half-timbered cottages and manor houses of Tudor and Elizabethan England. The Red House was built with red brick, not readily available locally, but probably made by Gibb & Sons, at Auchinlee, Cleland, Lanarkshire. These bricks were used in the building of a length of wall half a mile further south down Auchengreoch Road. The 1901 census records the house having a total of 11 rooms. Alterations, possibly an extension to the rear of the house, were carried out between April 1908 and April 1909 under the supervision of Honeyman, Keppie & McIntosh, at a cost of £493-10-5. Perhaps with the death of his mother in 1907 McKechnie may have fallen heir to a substantial inheritance, and used some of it to fund the improvements to his house. A description of the house is given later when it was advertised for sale in 1940. It is not known if Charles Rennie McIntosh had any involvement in any of the works. Also commissioned at the time of the building works was an order for 12 dining room chairs. This would suggest that McKechnie was intent on entertaining guests on a larger scale than previously deemed sufficient. The Red House was not only a place for social gathering, on at least one occasion a marriage took place within its walls. On the 13th March 1917 Lieutenant Stanley Evlyn Lewis of the Royal Flying Corps married Elizabeth Riddell. He was the youngest son of Colonel John Lewis C.M.G. Union Defence Force, South Africa, she was a daughter of Dr John Riddell of Ayr. The ceremony was performed by Robert McKenzie, Minister of Kilbarchan, and J. Johnstone Wright, Service Chaplain, India. At the same time Alexander McKechnie commissioned a brass memorial plaque in memory of his grandfather Robert McKechnie, a physician in Paisley, and his wife, mother, and sister. The plaque is mounted in the North Transept of Paisley Abbey. As a point of interest, the Ordinance Survey Map revision of 1895 shows a symbol on the house indicating a position of antiquity. Was this deemed to be the site of the old Cochrane Castle as opposed to the Lairds Tower Monument site on the adjacent land? Alexander McKechnie was the son of Dr William McKechnie, M.D. who practiced for many years in Paisley and within the County. His mother, Helen Landale Balfour was a cousin of Lord Kinross. He was born in Paisley, in October 1860. Later the family lived at Thorndean, Elderslie, a large house adjacent to Thornhill House and Elderslie Church. Although his father and grandfather were both prominent in the medical profession Alexander had decided on a career in business. After an extensive education culminating at St. Andrews University, he trained in accountancy. He early decided that his vocation was elsewhere and studied at the Glasgow School of Art. He was regarded as a most distinguished student, proficient in both oil and water colours. His later works were almost entirely in watercolours, most notable for the fine drawing and delicate colouring. He favoured landscapes of bright colours and particularly scenes from the countries of North Africa, such as Egypt, Tangiers and Algeria. His picture “Hall of the Pillars of Karnak” is especially memorable. A Shipping Passenger List of March 1927 lists Alexander, artist, and Helen McKechnie returning to the United Kingdom from Tangier. Travelling with them was Jessie Keppie, artist. She was the youngest sister of John Keppie, a junior partner in the architectural firm of Honeyman, Keppie and McIntosh, and had been briefly engaged to Charles Rennie McIntosh. She was distraught when he broke off the engagement and never married. Presumably she was acquainted with the Red House. He was a member of the Royal Scottish Society of Painters in Water Colours, the Royal Glasgow Institute of the Fine Arts, an artist member of the Paisley Art Institute, also for a period president of the Glasgow Art Club. He died in 1930 and was laid to rest in Woodside Cemetery. After his widow Helen died in 1935 the Red House was put up for sale. The next occupant was George Nicholson. He was born in Consett, Co. Durham, in 1905, originally a Newcastle bus fleet owner, he took possession of The Red House in May 1936. He had founded Northern Airways at Cramlington Airfield, a few miles to the north of Newcastle, on 1st July 1934, to provide a daily service from Newcastle to Carlisle and the Isle of Man. It was not viable and operated only till the end of October 1934. In November 1934 the company had been changed to Northern and Scottish Airways, and was now based at Renfrew. On December 1935 the new company started twice weekly flights from Renfrew to Glenbrittle in Skye, using De Havilland DH 84 Dragon Rapide aircraft. The service was eventually expanded to include routes to Islay, Tiree, North and South Uist, and Barra. In 1936 it pioneered the use of the beach on Barra as a landing strip, where flight times were subject to the times of the tides. The De Havilland Dragon Rapide was a twin engined six seater biplane, which made its first flight in 1934. They continued to grace the skies over Scotland into the 1950s. In 1937 on the amalgamation with Scottish Airways Ltd. of Inverness, the new company became known as Scottish Airways. With the coming of War in 1939, all internal air services were suspended, thus depriving George Nicholson of his livelihood. The Red House was once again put up for sale. The Red House was advertised in the Paisley & Renfrewshire Gazette on 9th March, 1940, and gives a full description of the house……..
Accommodation----3 Public Rooms, 5 Bedrooms, 2 Maids Rooms, 3 Bathrooms, Kitchen, etc. Electric Light and Power. Electric Refrigerator, Central Heating, 2 Garages. Ground extends to approximately 2 ½ acres. Entry at Whitsunday or earlier, as may be arranged. George Nicholson held the position of Scottish Divisional Manager of B.E.A. till July 1947 when he was either dismissed or resigned from the Corporation. Whatever the reason for his departure he was recognised as a pioneer of aviation in Scotland and was responsible for much of the expansion and advancement of its air services. He was not long idle. By September 1847, at the Annual General Meeting of Vaux and Associated Breweries Ltd. in Sunderland he was proposed and elected a director. When exploring the possibilities of business expansion into South Africa for the company in December 1950, he died suddenly in Johannesburg at the age of 45. The next owner and occupier of the Red House was Charles H Johnson, managing director of Dent & Co. & Johnson Ltd, Linwood. The son of a naval architect from Dumbarton, he was firstly employed there with Messrs. Wm. Denny & Bros., Ltd. Here he developed and patented the Denny-Johnson torsion meter, a device for measuring the horsepower of marine turbines. Another invention to his credit was a watertight loud-speaker telephone which was taken up by Messers. Kelvin & Jas. White Ltd.,with whom he was later employed for some years as assistant works manager. In 1912 he was involved in the takeover of the navigational instrument part of the London based company of Messrs. E. Dent & Co. Ltd., (makers of “Big Ben”) and the formation of Dent & Co. & Johnson, Ltd. Linwood. Dent and Co., were at the time involved in the early stages of development of navigational compasses for aircraft. Mr Johnson was the source of many ideas throughout the development of these instruments. He had an interest in radio broadcasting, his firm produced a radio receiver and loudspeaker known as “The Linwood” which was believed to be the only radio produced in Scotland at that time. Charles Henry Johnson died of a heart attack while on holiday in Thurso, in August 1944. His widow eventually retired to Aberfeldy, where she died in 1969 at the age of 79. Sometime later, certainly during the 1980s, the Red House became “The Red House Inn,” a public house. 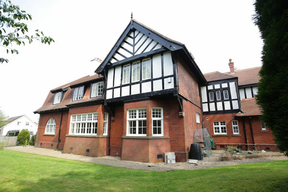 The Red House is currently (2016) in use as a care home providing high quality residential care for a maximum of five children aged 12 to 19 years old who may have a learning difficulty or mental health problems. Download this article (PDF). Republished in PDF format December 2, 2018 by permission of the author.